Maya Simmons Rogers is the Managing Partner of Simmons Rogers, LLC. Attorney Rogers attended Florida A&M University and interned with several Fortune 500 companies including Southern Company - Georgia Power, Procter & Gamble, and Ernst and Young during her tenure. 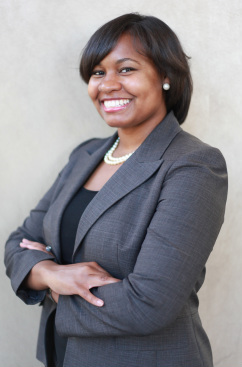 After graduating from Florida A&M with both her undergraduate and graduate degrees, Attorney Rogers moved to Ann Arbor, Michigan to attend law school. During law school, Attorney Rogers was very active on campus and served in several elected and appointed leadership positions. While attending the University of Michigan Law School, Attorney Rogers also had the opportunity to extern with the South African Human Rights Commission in Cape Town. Following her externship, Attorney Rogers moved to Atlanta, GA to work in the ERISA Litigation group at Alston & Bird, LLP. During her time at Alston & Bird, Attorney Rogers gained extensive experience representing numerous Fortune 500 employers and defending large national insurance companies against claims for denied health, disability (short and long term), and life insurance benefits. Attorney Rogers has represented her clients in numerous litigation matters, mediations, and arbitrations. Attorney Rogers is a proponent of alternative dispute resolution and became a Georgia Office of Dispute Resolution registered neutral in 2013. Attorney Rogers has also had the opportunity to assist her business clients and others with more personal matters. Attorney Rogers has helped entrepreneurs and other clients plan for the end of life as well as possible incapacitation. Attorney Rogers has also helped her clients navigate life-changing events such as adoption, pre-nuptial agreements, child support, divorce, and tragic accidents. While practicing law is time consuming, Attorney Rogers has always found time to give back. She served on the executive board of the Georgia Association of Black Women Attorneys, a bar association of more than 600 judges, lawyers, and law students; participated with Everybody Wins Power Lunch Reading Program, Project SALUTE, Georgia Appleseed's Heir Property Project, and completed countless hours of pro bono legal services throughout her career. Attorney Rogers served on the Board of Directors for the Refugee Women's Network for four years and was also the Board Treasurer. She currently teaches Business Law and Business Ethics at a national university in the metro-Atlanta area. As a result of her experience and service, Attorney Rogers was recognized as one of The National Black Lawyers Top 40 Lawyers Under 40 in 2015, 2016, 2017, and 2018. This honor is given only to a select group of top lawyers based on their achievement, community involvement, leadership, superior skills and qualifications. Attorney Rogers is a native of Southwest Georgia, more specifically Albany, Georgia, who relocated to Atlanta, Georgia to practice law. Attorney Rogers believes deeply that practicing law is a way for her to help people and to help make the world a better place.